The last week has seen China engage in a ferocious amount of military diplomacy. China’s military diplomacy has been heating up on all fronts over the past week or so. Most notably, China is currently participating in the Rim of the Pacific Exercise, the world’s largest international maritime warfare exercise, for the first time this month. As previously noted, China sent the second largest delegation to the RIMPAC exercise this year. Its RIMPAC fleet includes the missile destroyer Haikou, the missile frigate Yueyang, the supply vessel Qiandaohu, the Peace Ark hospital ship, two helicopters and a dive unit, along with 1,100 personnel. More controversially, China sent an uninvited Dongdiao-class auxiliary general intelligence (AGI) ship to spy on the exercise just as it did for the 2012 RIMPAC when it wasn’t a participant. 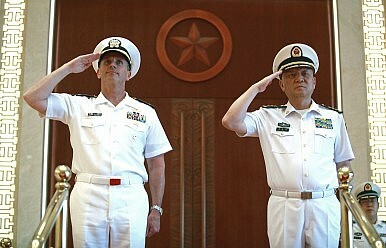 Similarly, last week Adm. Jonathan Greenert, the chief of operations of the U.S. Navy, visited China. While there, he held meetings with his Chinese counterpart, Adm. Wu Shengli, the commander in chief of the People’s Liberation Army Navy (PLAN). It was third meeting between Greenert and Wu over the past year. Moreover, Wu gave Greenert a tour of China’s first aircraft carrier, the Liaoning, during the trip. U.S. Defense Secretary Chuck Hagel was given a similar tour of the aircraft carrier earlier in the year. In a post-trip interview with the Wall Street Journal, Greenert also revealed that Wu asked him to reciprocate the gesture by bringing one of America’s aircraft carriers to China. According to the report, Wu asked Greenert to send the USS George Washington, an aircraft carrier based in Japan, to a mainland Chinese port so that the crew of the Liaoning could get a tour of it. China is currently in the process of try. “He’d [Wu] like his crew to get a tour of the George Washington and have the George Washington crew, a gaggle of them, come to the Liaoning,” Greenert told the Wall Street Journal. “I’m receptive to that idea,” he added. The PLAN are trying to perfect the art of operating an aircraft carrier. The WSJ report noted that other Chinese sailors were given a tour of the USS Ronald Reagan, another U.S. aircraft carrier, during the RIMPAC exercise. At the same time that Greenert was in China last week, a top PLA officer was visiting Australia. Specifically, General Fan Changlong, a vice-chairman of the Central Military Commission– China’s top military decision-making body– visited Australia to hold talks with Prime Minister Tony Abbott. While there, General Fan also met with Australian Defense Minister David Johnston, Foreign Minister Julie Bishop, and Defense Air Chief Marshal Mark Binskin. Following his trip to Australia, General Fan traveled to New Zealand where he met with Prime Minister Jonathan Key, Defense Minister Jonathan Coleman, New Zealand Chief of Defense Force, Lieutenant General Tim Keating, and Acting Secretary of Defense, Tony Lynch. The New Zealand press release on Gen. Fan’s visit noted that the two sides had agreed to strengthen bilateral security ties. This included agreeing to hold the 7th China-New Zealand Strategic Defense Dialogue in China later this year. The New Zealand press release also listed the senior Chinese military officials that are traveling with Gen. Fan. This included: Deputy Chief of the General Staff of the PLA, Lieutenant General Wang Ning, the Political Commissar of the PLA Navy, Admiral Liu Xiaojiang, the Commander of the Guangzhou Military Region, General Xu Fenlin, and the Deputy Commander of Guangzhou Military Region and Commander of Guangzhou Regional Air Force, Lieutenant General Xu Anxiang. It didn’t mention whether these same individuals would be traveling with Gen. Fan throughout his trip. Following his stop-off in New Zealand, Gen. Fan traveled to Indonesia where he met with Indonesian Defense Minister Purnomo Yusgiantoro, Vice President Boediono and Indonesian Military (TNI) commander Gen. Moeldoko. The Jakarta Post’s report on Gen. Fan’s visit suggests it was a lot more acrimonious than the PLA general had hoped. Specifically, the report noted that Gen. Fan had tried to focus on bilateral military ties with Indonesia but Defense Minister Purnomo raised the issues of China’s aggression in the South and East China Seas. “Indonesia is not a claimant in the South China Sea dispute. However, as part of Indonesia’s role in multilateral cooperation, we want the South China Sea to be a peaceful and open sailing area given the fact that ships carrying commodities pass through the area,” Purnomo said, according to the report. Meanwhile, back in Beijing this week, Chinese Defense Minister Chang Wanquan hosted Baek Seung-joo, South Korea’s vice defense minister, for the 4th China-ROK Defense Strategic Dialogue. China’s Army Deputy Chief of Staff Wang Guanzhong also participated in the talks. The strategic dialogue comes on the heels of President Xi Jinping’s trip to South Korea earlier this month. The most significant outcome of the bilateral dialogue appears to be an agreement for South Korea and China’s defense ministers to set up a hotline to facilitate communication. “During the talks, the two sides signed a memorandum of understanding to set up a hotline by the end of this year between defense ministers of South Korea and China,” an anonymous South Korean diplomat told Yonhap News Agency. Who Will Be Xi’s Number 2 on China’s Central Military Commission? Gen. Fan Changlong is due to retire at the 19th Party Congress. Who will replace him as China's top military official?